BTC Commentary: I guess the idea here is that if you take the time to make an expensive, tech savvy card, those who intend to fake it to break the system will find a way. The rest of us shouldn't put up with the addded costs and the hassles managed into our already overcomplicated lives. "We're supposed to be operating on a risk basis as far as homeland security," Dent said. "I don't think mule drivers in colonial garb rise to the level." - Charlie Dent, canal boat passenger. 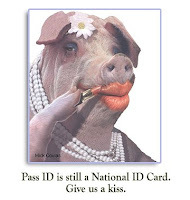 The state of Utah would thumb its nose at federal requirements of the 2005 REAL ID Act under provisions of a bill that passed the House on Thursday. Under provisions of HB64, sponsored by Rep. Stephen Sandstrom, R-Orem, the Utah Driver's License Division would be prohibited from implementing the requirements of REAL ID — a move Sandstrom said many states have already made. "Utah … would be joining 21 states that have done the same thing," Sandstrom said. "This really is the framework for all kinds of government intrusion in our life." Rep. Bradley Daw, R-Orem, testifying in support of the bill told the body that complying with REAL ID was not a simple, or inexpensive, task. "It is not a minor change to the driver's license," Daw said. "The quote is anywhere from $20-80 million … we should be able to manage our driver's licenses the way we see fit." 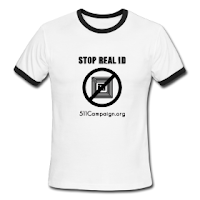 AUSTIN- According to a staffer for Texas State Representative Richard Pena Raymond, DPS approached the Vice Chair of the Appropriations committee for funding to implement Real ID in the State of Texas and was firmly denied.